The town of Lisbon had risen, in the first colonial efforts of Portugal, to a vast importance. True, the Portuguese did not, as others have done, attach their whole policy to possessions over-sea, nor rely for existence upon the supremacy of their fleet, but the evils necessarily attendant upon a scattered commercial empire decayed their military power and therefore at last their commerce itself. The capital was no longer, in the Arab phrase, “the city of the Christian”; it was long fallen from its place as the chief port of the Atlantic when, in these last days of October, 1755, the messengers of the Empress entered it and were received; but it was still great, overlooking the superb anchorage which brought it into being, and presenting to the traveller perhaps half the population which it had boasted in the height of its prosperity. It was a site famous for shocks of earthquake, which (by a coincidence) had visited it since decline of its ancient power; but of these no more affair had been made than is common with natural adventures. Its narrow streets and splendid, if not majestic, churches still stood uninjured. The valley upon which stood the commercial centre of Lisbon is formed of loose clay; the citadel and the portion which to this day recalls the older city, of limestone; and the line which limits the two systems is a sharp one. 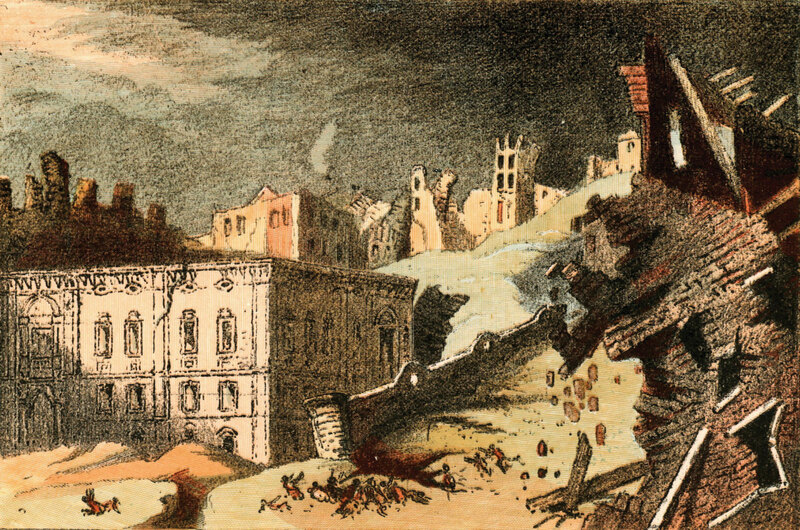 But though the diversity of such a soil lent to these tremors an added danger, they had passed without serious attention for three or four generations; they had not affected the architecture of the city nor marred its history. In this year, 1755, they had already been repeated, but in so mild a fashion that no heed was taken of them. By All-Hallowe’en the heralds had accomplished their mission, the Court had retired to the palace of Belem, which overlooks the harbour, and the suburbs built high beyond that Roman bridge which has bequeathed to its valley the Moorish name of Alcantara. The city, as the ambassadors of Maria Theresa and the heralds of her daughter’s birth were leaving it, was awaiting under the warm and easy sun of autumn the feast of the morrow. In the morning of that All Saints, a little after eight, the altars stood prepared, the populace had thronged into the churches; the streets also were already noisy with the opening of a holiday; the ships’ crews were ashore; only the quays were deserted. Everywhere High Mass had begun. But just at nine — at the hour when the pressure of the crowds, both within the open doors of the churches and without them was at its fullest — the earth shook. The awful business lasted perhaps ten seconds. When its crash was over an immense multitude of the populace and a third of the material city had perished. The great mass of the survivors ran to the deserted quays, where an open sky and broad spaces seemed to afford safety from the fall of walls. They saw the sea withdrawn from the shore of the wide harbour; they saw next a wave form and rise far out in the landlocked gulf, and immediately it returned in an advancing heap of water straight and high — as high and as straight as the houses of the sea front. It moved with the pace of a gust or of a beam of light toward the shore. 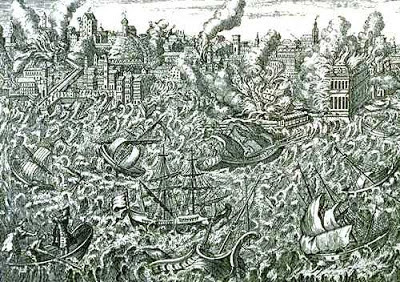 The thousands crammed upon the quays had barely begun their confused rush for the heights when this thing was upon them; it swirled into the narrow streets, tearing down the shaken walls and utterly sweeping out the maimed, the dying and the dead whom the earthquake had left in the city. Then, when it had surged up and broken against the higher land, it dragged back again into the bay, carrying with it the wreck of the town and leaving strewn on the mud of its retirement small marbles, carven wood, stuffs, fuel, provisions, and everywhere the drowned corpses of animals and of men. During these moments perhaps twenty, perhaps thirty thousand were destroyed. Two hours passed. They were occupied in part by pillage, in part by stupefaction, to some extent by repression and organization. But before noon the accompaniment of such disasters appeared. Fire was discovered first in one quarter of the city, then in another, till the whole threatened to be consumed. The disorder increased. Pombal, an atheist of rapid and decided thought, dominated the chaos and controlled it. 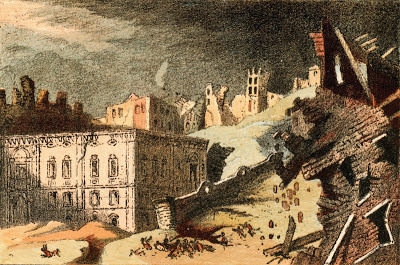 He held the hesitating court to the ruins of the city; he organized a police; as the early evening fell over the rising conflagration he had gibbets raised at one point after another, and hung upon them scores of those who had begun to loot the ruins and the dead. The night was filled with the light and the roar of the flames, until, at the approach of morning, when the fires had partly spent themselves and the cracked and charred walls yet standing could be seen more clearly in the dawn, some in that exhausted crowd remembered that it was the Day of the Dead, and how throughout Catholic Europe the requiems would be singing and the populace of all the cities but this would be crowding to the graves of those whom they remembered. That same day, which in Lisbon overlooked the cloud of smoke still pouring from broken shells of houses, saw in Vienna, as the black processions returned from their cemeteries, the birth of the child.